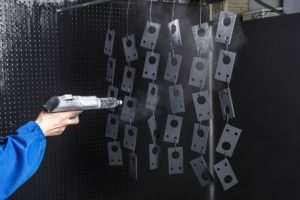 Metal Finishing | Quality Sheet Metal Inc.
Quality Sheet Metal (QSM) specializes in a wide variety of high-quality metal finishing services to enhance the physical and mechanical properties of fabricated metal components. Drawing on over four decades of experience, our knowledgeable staff can achieve almost any type of finish for virtually any application or environment. To further support our customers’ needs, we offer a broad range of capabilities including precision laser cutting, CNC machining, metal stamping, and welding. These in-house services enable us to provide single-source solutions for our customers’ diverse metal fabrication needs. For unique projects with highly specialized requirements or specifications, QSM also partners with local certified suppliers and industry professionals to handle customized jobs. Annealing – Also known as heat treating, this process reduces metal hardness, enhances ductility, and improves machinability. 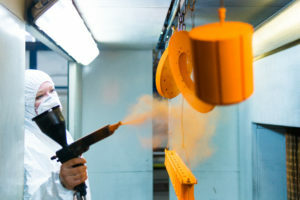 Anodizing – An electrochemical process that passivates a metal surface by creating a corrosion-resistant oxide finish, this method can also be integrated with various colors for decorative purposes. Deburring – Using grinding, tumbling, and vibratory deburring techniques to remove rough or jagged edges produced during manufacturing, deburring is typically employed to enhance metal appearance and improve dimensional tolerances. Electropolishing – This electrochemical process removes unwanted material from a metal workpiece. Ideal for making a metal surface featureless, electropolishing can be used as an alternative to traditional mechanical methods such as grinding, milling, blasting, and buffing. Laser marking/engraving – Utilizing cutting-edge laser technology, laser marking produces precise and high-quality engraving (lettering or patterns) on a variety of metal or alloy surfaces. Coating – Offering several traditional coating services including powder, phosphate, epoxy, and Teflon coating, QSM can also apply customized surface coatings in accordance with customer requirements. Quality Sheet Metal’s dedicated team of engineers and technicians is committed to providing complete customer satisfaction for clients across all industries. Our strict operating procedures and investments in the latest technology enable us to fabricate components that meet or exceed the specifications of almost any industry. Whether a project involves the manufacture of enclosures, chassis and covers, panels and brackets, or a completely unique design, our staff is ready to produce the components and parts our customers need in a timely, high-quality manner. We also provide up-to-the-minute order status updates, offering customers full transparency into the progress of their project from order placement through delivery. Our computer-based order entry, router sheets, and barcoding systems guarantee accurate updates at any phase of the manufacturing process. Ready to get started with QSM on your next metal fabrication project? Contact a member of our team today.